• Apparent confusion about the distinction between the cost of reliable electrical service and the prices at which wind turbines sell electricity. It also includes an insider’s comment about how preferential treatment by government influences wind’s role as source of electricity. The comment is “…we get a tax credit if we build a lot of wind farms. That's the only reason to build them. They don't make sense without the tax credit ...”. We is Berkshire Hathaway, which owns about 8.5% of U.S. wind turbine capacity. The quote is from the 12 May 2014 issue U.S. News & World Report. Other periodicals have the same quote. Disputing my point about reliable power’s cost by pointing out wind wins the bidding process reveals confusion about who picks what. A brief, basic description of the decision making process may resolve the confusion. Electricity system decision makers choose between capacity and energy offers from wind turbines, solar panels and conventional generators. Relative prices, government mandates and dispatchability heavily influence how much of each is selected. The quantities are combined into firm service and interruptible service. 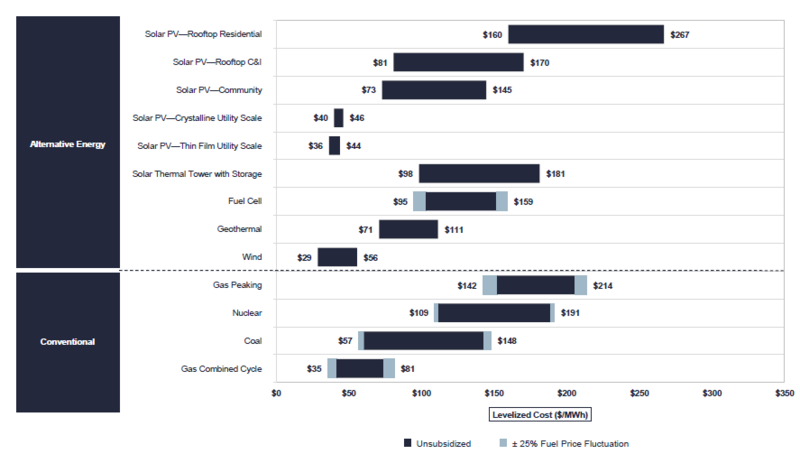 Reliable service’s cost reflects the sum of prices paid for all the components (baseload + dispatchable + renewables + … ). The same is true of interruptible service’s cost. Households, businesses, schools, government agencies and other electricity users choose between firm service and interruptible service. Some choose both. The cost of firm service vs. interruptible service influences the decision. Wind’s selling price typically only indirectly influences the decision, if wind is considered at all. Firm service is reliable service. Customers get all the electricity they want when they want it—24 hours a day, 365 days a year …. .
Interruptible service allows the system operator to restrain or to reduce the quantity of electricity delivered to a customer. Typically, the limitations are temporary. Sophisticated electricity buyers understand the cause and effect relationship between the behavior of wind power and the amount of power delivered to them. They also have expectations for the adverse financial consequences of reduced deliveries. The adverse consequences are weighed against interruptible service’s discount relative to reliable service. Wind’s concurrent selling price influences the decision only if wind obviously influences on the discount (An example is an electricity user that prices some or all of its power with reference to wholesale or spot power prices. 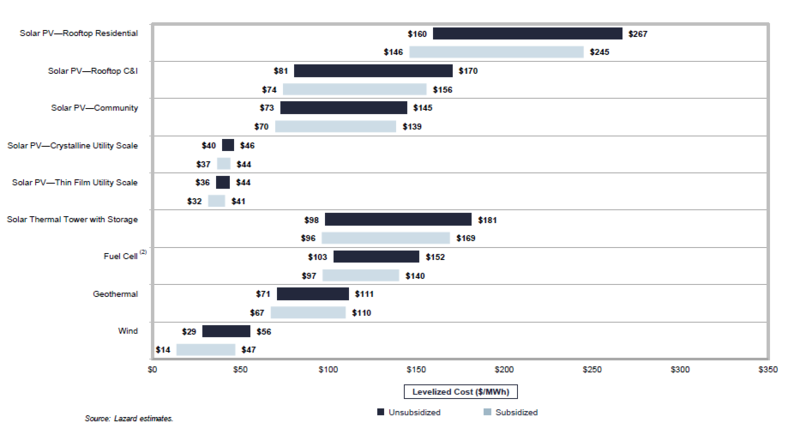 Wind power frequently dominates wholesale / spot electricity prices). Spinning reserves perform functions different than the pairing of wind turbines with solar panels, and the need for the functions persists when wind is paired with solar. Solar and wind can complement each other where seasonal, daily or other surges in one offset contemporaneous lulls in the other. The pairing can also compensate for mismatches between seasonal, daily or other routine fluctuations in demand for electricity and wind turbine output or solar panel output. For example, the Georgetown, TX municipal electricity utility pairs solar with wind. A major reason for the pairing is: Seasonal demand peaks when the solar panel capacity factor is high and the wind turbine capacity factor is low. In contrast, a major function of spinning reserves is to cope immediately with very short term fluctuations in electricity demand and supply. The causes, timing and nature of the fluctuations typically cannot be forecast. But, experience has taught operators of large electricity systems that something routinely goes wrong somewhere. When Murphy causes a problem, spinning reserves are part of the solution. When backing up renewables, spinning reserves help cope with routine, very large short term changes in wind turbine output. Such changes occur during the night, when solar panels are idle. They also occur during the day, when the electricity system is already tuned to the inflow of solar electricity. Allegations of fakery put forth by a fossil fuel troll violate the “3 Myths … “ expressed goal of promoting positive discussion (see the blog's introduction). Furthermore, such allegations are blatantly false. Those alleging fakery are challenged to point out where fakery occurred. Is there fakery, an arithmetic mistake or a typo in these calculations? 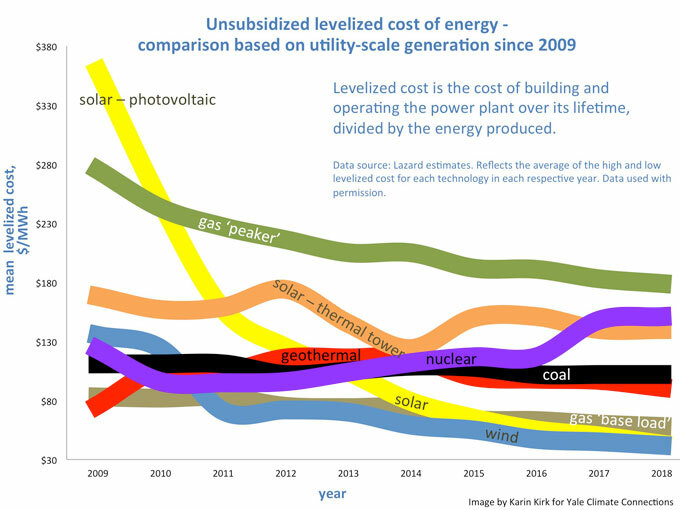 Do $205, $40 and $55 misrepresent 2018 values for peaker, wind and baseload costs shown on the levelized cost graph featured in the “3 Myths …. “ blog? Does the graph misrepresent the relative prices of each? Do you challenge the validity of data provided by ERCOT and ISO New England? Do you dispute that wind electricity is intermittent and variable, as generally described and as shown by data provided by ERCOT, ISO New England, The Alberta Electric System Operator, the Australia Energy Market Operator, Germany’s regional operators and others? Do you dispute that reliable service has been and remains a key objective of electricity system operators? Do you dispute the necessity of supplementing wind with other sources of power to create reliable service? With regards to the shares of reliable energy supplied by peakers, wind and spinning reserves, my estimates favor wind. Wind turbine opponents in the recent past typically claimed that every 100 MW of wind capacity had to be backed up by 80 to 100 MW of conventional generating capacity, and that much of the back-up capacity had to operate 24/7. In contrast, my split is 100:55 approx., and only about 5 needs to operate continuously. Furthermore, my splits suggest reliable service structured around wind turbines cuts by 40-50% CO2 emissions relative to reliable service structured around natural gas. These are NOT results a fossil fuel troll would proclaim. A wise person once advised: Progress should not be impeded by the pursuit of perfection. Those truly concerned about the environment should settle for progress achievable and feasible today to improve conditions over the next several years and concurrently work towards better solutions to be implemented in the future. That is far more constructive than savaging suggestions that differ by degree rather than direction. scaddenp, you did in fact move the goal posts. You wound the clock back a few years. You substituted the Australian average for the South Australia price. During 2017H2, the South Australian electricity price, A$47.13, exceeded prices in Germany and Denmark. Statista.com provides German and Danish prices in euros, respectively 30.48 & 30.1. The AUD:euro rate can be found at many online sites. 1.504 is representative. Converted to AUD, the German and Danish prices are A$45.8 and A$45.3. With regards to levelized costs, while useful, they are flawed. Major flaws distorting onshore wind costs include the capacity factor assumptions (too high) and the service life (too long). Plus, the target ROI for wind is too low relative to natural gas fueled generators. Correcting these flaws significantly raises estimates of wind's full production costs in the absolute and relative to other sources for electricity. FYI, you can make the adjustments on and Excel spreadsheet to see for yourself. Also, FYI, estimates for natural gas and other generators are also appropriate. In response to my statement that your link does not support your calculations you have simply repeated your calculations. You have still not provided any links to support your calcualtions. You appear to have made up your calculations out of the air. If you make up calculations you can reach any conclusion you want. You need to completely delete your spinning reserve for two reasons: Renewable energy does not need so much spinning reserve and you have miscalculated the cost of spinning reserve. Spinning reserve does not produce power (that is why it is called spinning reserve) and has a cost only a small fraction of generating power. No-one proposes using a wind only system. As I stated above, the combination of wind and solar requires much less gas back up. You should reduce the amount of gas needed by at least 75%. I recommend you look at actual bids from renewable energy before you start your calculations and provide data to support your wild assumptions. Since you have demonstrated that you have no idea how to calculate costs you must provide a revieiwed citation to support your wild claims. Peer reviewed sources like the ones I cited above show that wind and solar are as reliable as fossil fuels and nuclear power but renewable energy is cheaper.